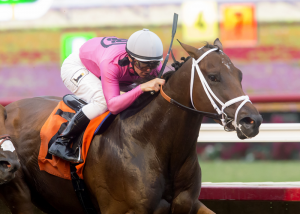 DEL MAR, Calif. (July 28, 2017) – Mr. Hinx outdueled even-money favorite Ann Arbor Eddie through the stretch to win Friday’s $150,000 Real Good Deal Stakes for Golden State Series eligible 3-year-olds at Del Mar. Mr. Hinx is by Ministers Wild Cat, out of the Put It Back mare Kitten Exchange, was bred by owner Gary Barber and is trained by Steve Miyadi. He has five wins in eight starts, earnings of $326,548 and was coming off a win in a June 9 optional claimer. Mr. Hinx ran the seven furlongs in 1:22.79 And won by a head at odds of 9-2. Edwards Going Left was third in the field of seven.